Vermont has enacted the nation’s first genetically modified food labeling law that is ready for implementation notwithstanding what other neighboring states might do or not do on the subject. In doing so, Vermont’s governor, Peter Shumlin, correctly anticipated legal challenges and created another first: a fund to help fight the lawsuits. So far, people from across the nation have contributed $17,225 to the Vermont Food Fight Fund. With the filing of lawsuits to overturn the GMO labeling law, including last week’s suit filed by the Grocery Manufacturers Association, the Snack Food Association, the International Dairy Foods Association, and the National Association of Manufacturers, the pace of contributions to the Fund should pick up. Those are heavy-hitters able to put big money to the fight against the GMO law. Vermont’s Attorney General Bill Sorrell estimates that the state might have to pay as much as $8 million to fend off these and other lawsuits. The law’s court opponents are using the creation of the privately capitalized Fund as “express confirmation that Vermont does not have a ‘state’ interest in the survival of the law,” according to the GMA lawsuit. That seems to run counter to the position of Governor Shumlin, who has been vigorous and vocal in support of the law. Moreover, the state isn’t simply relying on small private donations for the legal costs. The fund can receive as much as $1.5 million in legal settlements collected by the Attorney’s General office so long as the settlement funds aren’t otherwise designated for other purposes. The state legislature is also authorized under the law to appropriate additional funding from the General Fund. The legislature might want to gear up for some appropriation activity. In next-door New York State, the food manufacturing industry has been spending millions on lobbyists and campaign contributions to convince state legislators not to pass a similar GMO labeling law. 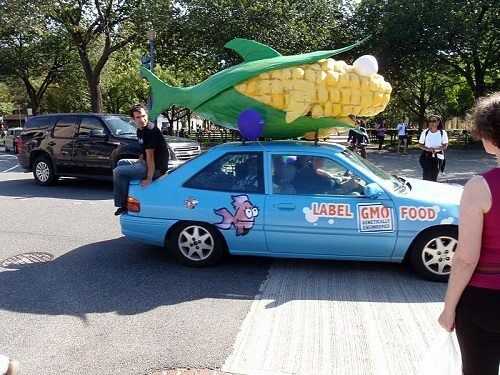 According to the New York Public Interest Research Group (NYPIRG), opponents of the GMO labeling bill spent $3.7 million in campaign contributions in 2013, seven times more than GMO labeling supporters put into electoral campaigns. Little Vermont’s GMO labeling case, which AG Sorrell says will be a “heck of a fight,” is going to be nationally important. In the absence of federal action, what happens at the state level will be the nation’s GMO response for the moment and perhaps for some time to come. Not only is New York another GMO battlefield, but Maine and Connecticut have already passed GMO labeling laws. However, those laws will not be implemented unless other states in the region also mandate GMO labeling. If Vermont’s law is overturned, Maine and Connecticut will get the answer that advocates do not want to hear. As China says “no, thank you” to accepting more dump waste and recyclables from the US, how can nonprofits declare themselves invested in the struggle to build a green future at home?